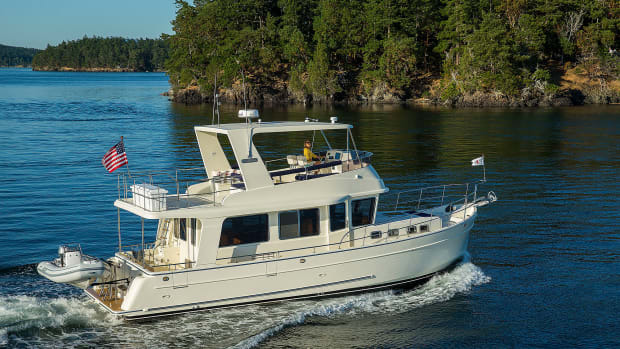 At Trawler Fest in Anacortes, Washington, PassageMaker’s editors asked for volunteers to test some new boats—a reality check allowing real cruisers to share impressions based on their experiences.I raised my hand and later found myself at the helm of the Greenline 40. 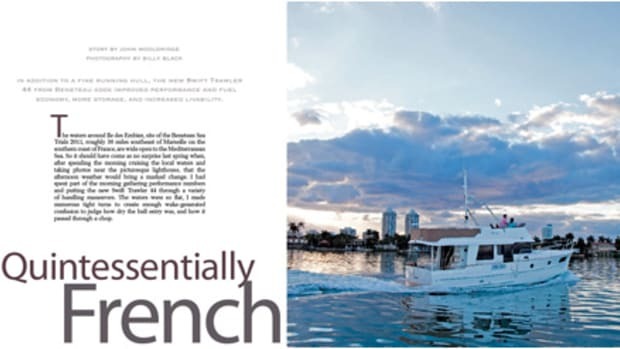 Built by Seaway Yachts, a Slovenian company, this diesel-electric hybrid cruiser integrates solar power, a super-slippery hull design, lightweight but rugged construction and modern looks. My motivation for the quick response for volunteers came from reading a bit about the Greenline 33, but thought “too small.” I had the same thought when the 40 was introduced, but when plans for a 48-footer came along, my curiosity was piqued, and I leaped at the chance to get an up-close look at the Greenline 40, considering it a preview of bigger things to come from Seaway Yachts. Stepping aboard the Greenline 40 via the fold-down transom, my wife and I were immediately impressed by the cockpit lounge area. The aft part of the saloon is entirely glass, and the port half can be raised to open to the galley, also located aft. The backsplash for the galley counter can be lowered to form a bar area in the cockpit. The saloon door slides open to starboard, seamlessly blending the interior and exterior spaces. Seats are built into the transom on both sides of the fold-down section, with room for a couple of deck chairs and a table in this open, but covered, space. There’s also generous storage in the lazarette under the cockpit for the chairs, table, and other gear that is accessible by a pair of hatches. The fold-down transom and opening partition make the cockpit lounge feel much larger than it actually is, a very clever use of the space. The glass enclosure facing the cockpit opens fully to blend both interior and exterior spaces seamlessly. 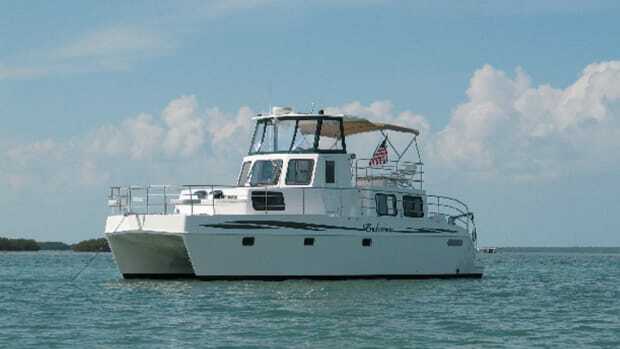 Entering the saloon, the port-side galley is well laid out, with plenty of storage, a good-size refrigerator-freezer unobtrusively built into a cabinet to starboard and nice touches like a trash bin that can be removed from the side deck. To the port side is a double sink, with cabinets above. My only quibble with the galley is the two-burner electric cooktop, which I would replace with either a propane or an induction unit. A propane cooktop is standard on Greenline’s non-hybrid models, and is a no-cost option on hybrids. Below the cooktop is a drawer and a microwave oven, with more drawers built into the end of the counter. Forward of the galley area is a comfortable, L-shaped settee and a table large enough to seat eight. Across to starboard is more storage, including provisions for a flat-screen TV on a lift. The side windows extend nearly the length of the saloon and from the back of the settee to the roofline, creating great sight lines throughout. There is plenty of headroom, and opening the optional sunroof really adds to the feeling that this is a large, airy, inviting space. 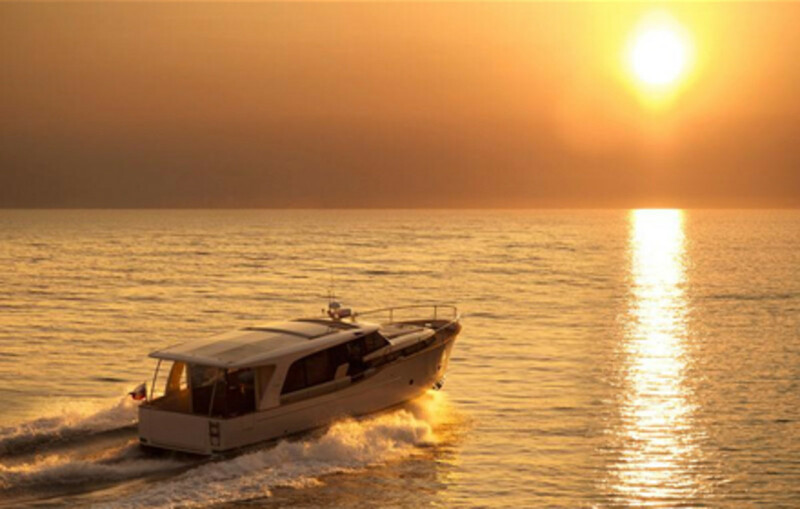 The starboard helm is well laid out and offers excellent visibility in all directions. The helm chair is double-wide and features a bolster for standing. A wood platform swings in and out to accommodate captains of different heights. 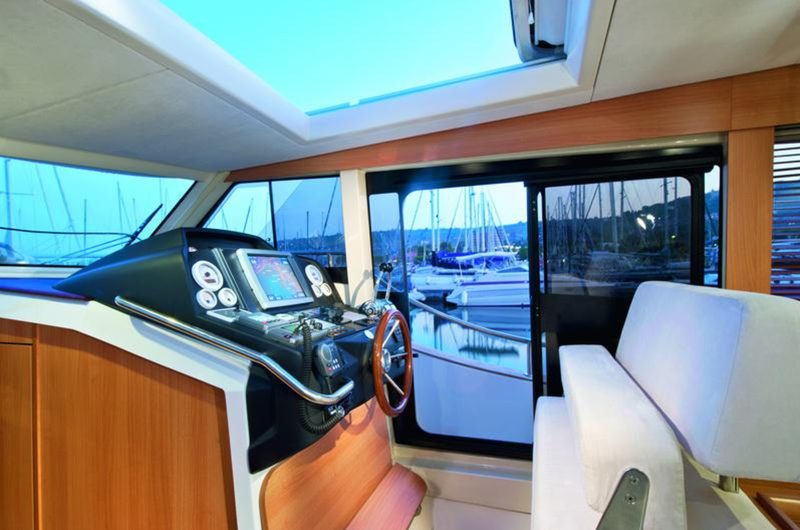 Next to the helm, a sliding door provides easy access to the side and foredeck, and the controls are arranged to be a comfortable reach from a seated or standing position. A unique feature of this helm is the “Greenpad,” an iPad running software that monitors all the vessel’s systems. 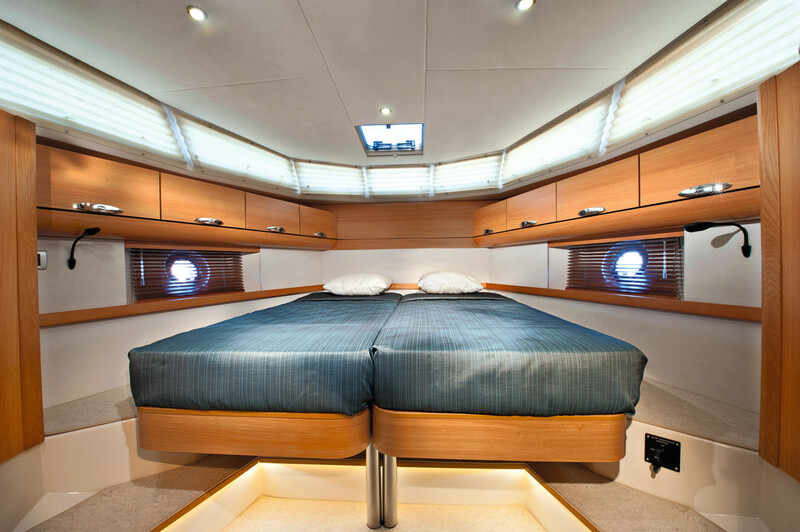 The Greenpad shows the state of the yacht’s energy-management systems, for example the solar charge flowing to the batteries and battery power flowing to the electric motors, in a manner similar to various hybrid car displays. Under way, the Greenpad displays complete engine monitoring data; such as rpm, range under battery power or fuel burn while using diesel power. While I loved having access to all the data, I’d like to see an option for customizing the display to allow owners to show a few critical parameters more prominently while under way. That said, the Greenpad does offer customization of various alarms and settings to meet many captains’ priorities and preferences. The Greenline&apos;s starboard mounted helm is well thought out, and features both cutting edge digital as well as analog displays. 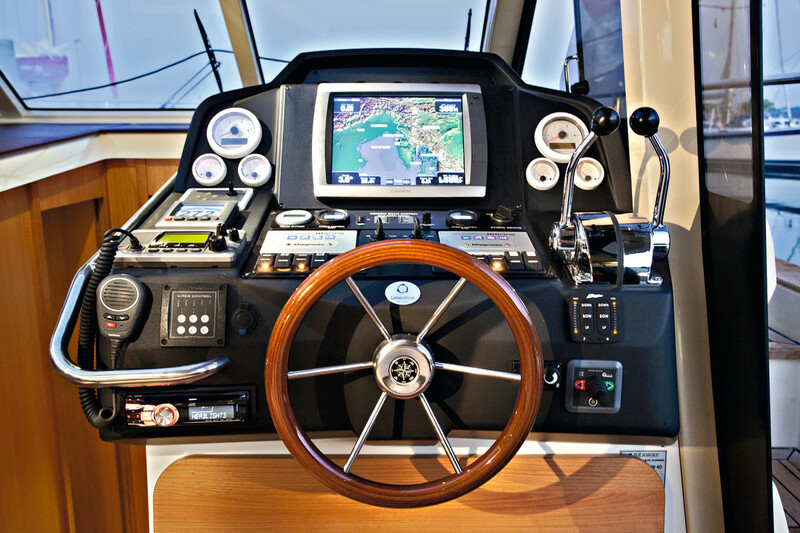 The helm is also equipped with analog gauges. My only complaint with the layout is that the electric and diesel engine monitoring gauges were small and positioned horizontally, making it tough to read rpm on the electric side and fuel burn on the diesel side. Placing them to either side of the excellent Garmin 5212 chart plotter might have been better. Also, though a rudder indicator is integral to the Greenpad display, I would like to see a rudder angle indicator front and center. To port of the helm is a companion seat. It is a nice feature but of limited utility, in my opinion, since it does not have a backrest and doesn’t face forward. That, along with the orientation of the settee, means that only the captain has a view forward, unless the first mate snuggles up close on the helm seat. Greeline’s core design concept is to combine hybrid power with a slippery hull and strong but lightweight construction. The “super displacement” hull design incorporates sail and powerboat principles; a sharp entry and rounded midsection leads to a rising, almost flat after section characterized by prop pockets and fixed stabilizer fins outboard. Low midships mounting of the engines results in a shaft angle of only one degree. The result is a very smooth, efficient and stable ride. Lots of glass allows tons of natural light inside, providing an airy, outdoorsy feel. Construction is optimized for weight, using vacuum-infused vinyl-ester resin, solid below the waterline and cored above. The fiberglass stringer grid is bonded to the hull, and then the floor liner is bonded to the grid for maximum strength. 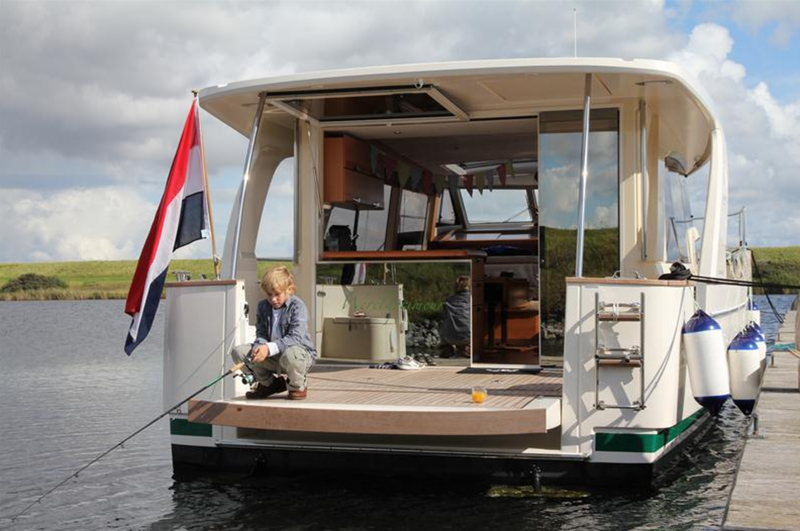 The interior is built in modular fashion outside the hull and then bonded to the hull structure. Finally, the deck and superstructure are added, and boats are tank tested. 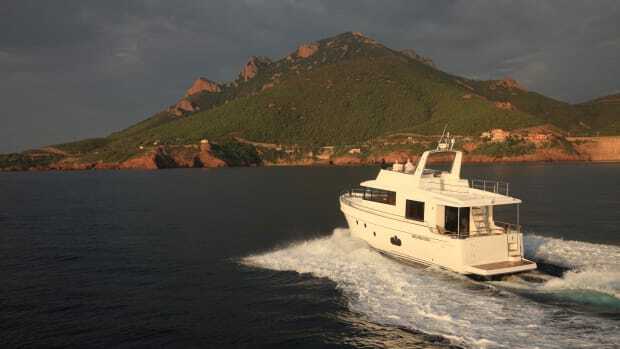 The master cabin has plenty of headroom and lots of light, with glass panels running all the way around the trunk cabin, portholes on either side and a hatch directly over the head of the Euro-style convertible V-berth. I was surprised at how well the berth worked, with the “V” easily coming together to form a comfortable double. I have to admit that my preference would be to have Greenline offer a real double as an option. I’m told many Greenline 40 owners simply attach both berths together permanently and install a full double mattress; a solution that is easy to execute and works well for anyone whishing a fixed double bed arrangement. There are cabinets and hanging lockers on both sides, providing lots of storage, and privacy shades for all the windows. A bulkhead-mounted 22-inch TV is optional. At the foot of the V-berth to starboard was a door to the shared head, which was nicely finished with a raised basin sink and separate shower. The guest cabin could comfortably accommodate two on singles, which come together to make a double. There was standing room at the foot of the berths, and in a very interesting touch, a sliding skylight that opened to the upper cabin. This, along with a porthole and the track cabin glass, provides lots of natural light, contributing to a feeling of spaciousness. This guest cabin was no dim cave, unlike many I have seen in boats of this size. WHERE DOES THE DINGHY GO? That was my question after seeing the elegant fold-down transom and the array of solar panels covering the cabin roof. The answer? There is a factory option for a lift mechanism consisting of davits that mount on the stainless steel roof supports on each side of the fold-down transom. The lift can accommodate weights of up to 264 lb, enough to carry a decent-size inflatable dinghy and outboard. We pulled out of the slip under electric power. It took me just a couple of moments to get acclimated to the steering response, and I didn’t need the thrusters to maneuver out of the fairway and through the breakwater. The trick for maneuvering under electric power was to use the throttles generously. With a maximum speed of about 6 knots, there is really no worry about pushing the throttles all the way forward. The ride under electric power is delightfully quiet, with little but the sound of water from the props. Closing the saloon door, sunroof and galley window made things even quieter. Pushing the boat to wide-open throttle, around 1400 rpm under electric power, gave a cruise speed of 6.1 knots and a range of about 10 miles. Backing off to somewhere closer to 5 knots yields a range of 15nm. Beds in the V-Berth can be split or slid together to form a double. We made the transition to diesel power by putting the boat in neutral, switching off the electric, switching on the diesel power, waiting for the glow plugs to warm up and starting the engine. It was all over in about 30 seconds, and off we went. 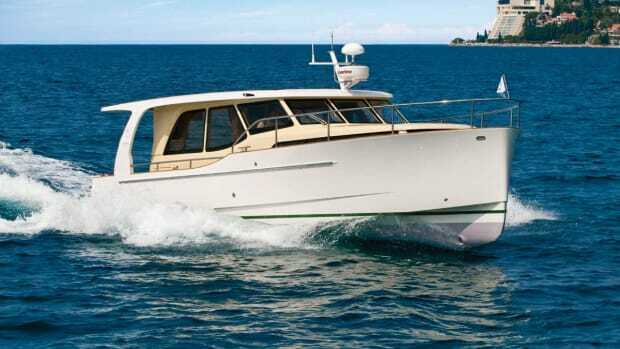 The test boat was powered by twin 150hp Volkswagen TDIs, which are sold and serviced as Mercury TDIs in North America. 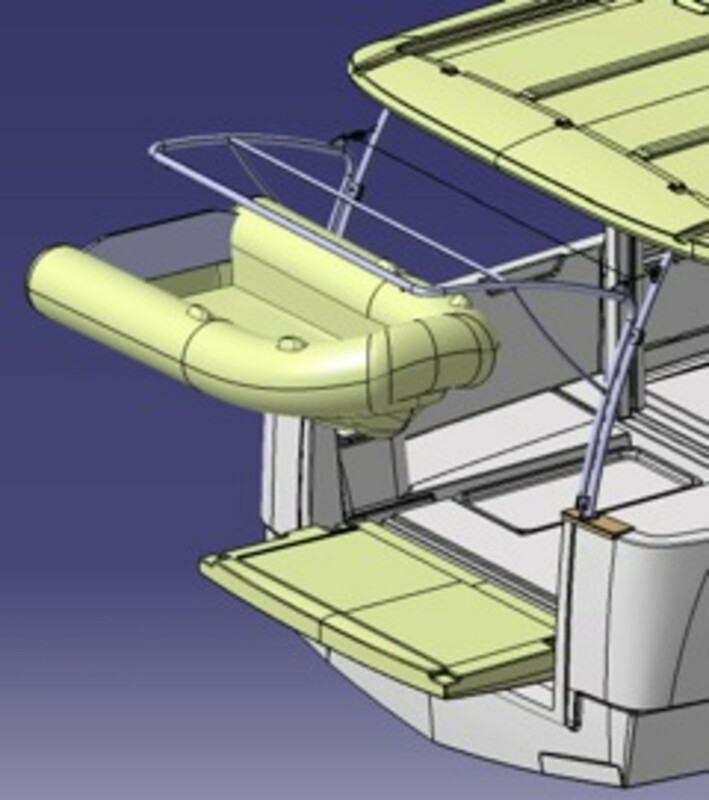 These are also surprisingly quiet, given that they are mounted directly under the cabin sole—a deliberate design to get them as low in the boat as possible, which results in a prop shaft angle of less than 1 degree. 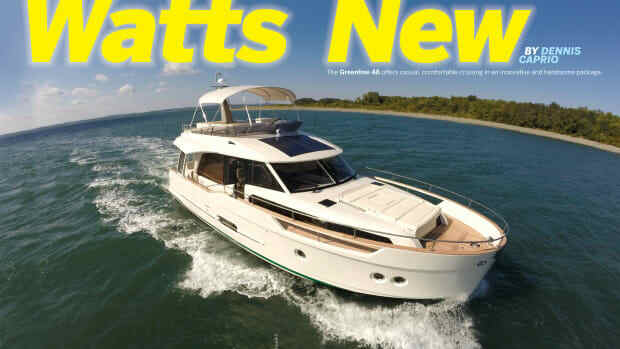 Volvo Pentas are also offered for the Greenline 40. Running her up to WOT, makes 17.5 knots at 3900rpm and burns about 15gph, for a very respectable 1.17nm per gallon. A small amount of bow rise evens right out by engaging the optional trim tabs. Wanting to get a feel for the Greenline 40’s seaworthiness on a flat-calm day, I turned the helm over hard to starboard, looking to come around on our wake. 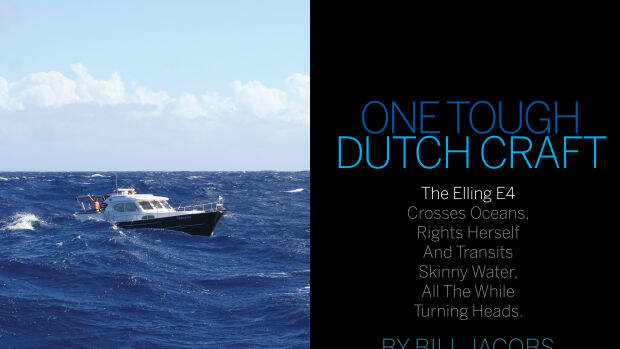 The boat carved a perfect circle on the water and stayed dead flat—not a hint of heeling into or away from the turn. This is a result of the two stabilizer fins mounted aft, outboard of the props; a truly amazing design. This boat tracks incredibly well, even without the standard autopilot. I think the sweet spot for the Greenline is running at about 3,000rpm for about 12 knots and 1.5nm per gallon. Back her down to 7.5 knots, and you’ll get close to 3nm per gallon. 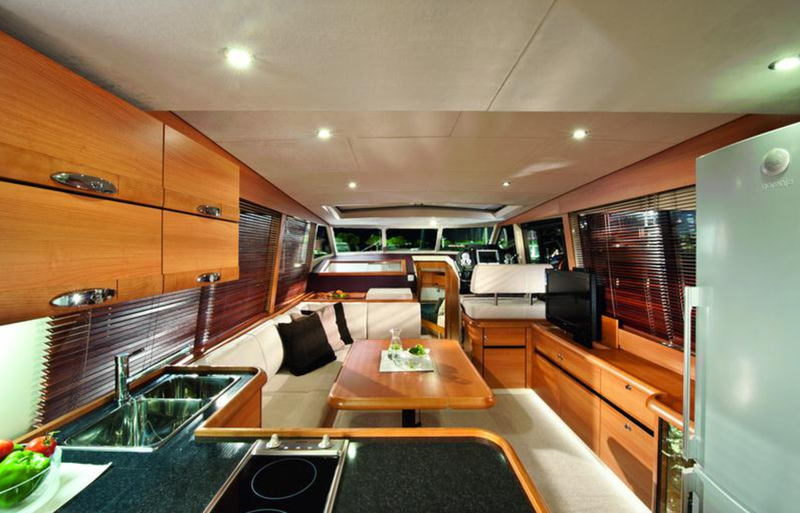 Greenline&apos;s interior feature a port side galley with a forward living a dining area. We managed to find a couple of wakes, which the Greenline handled with aplomb, even when I put her beam against them. The fins really do add to roll stability. The wind came up as we were reentering the marina, and with wind and current combined, we could feel the push against this very light (19,000lb) boat. It was easily overcome with a little bit of helm adjustment. The conditions provided a great test for the Greenline’s close-quarters handling. We pulled in downwind and downcurrent of the Cap Sante pumpout barge and used the thrusters to walk the boat sideways to the barge. An easy task to accomplish by alternating bumps of the bow and stern thrusters. The Greenline 40 comes equipped with a bow thruster as standard equipment, and in my opinion the stern thruster is an unnecessary, although nice to have, option. I loved the Greenline 40. The hybrid angle was what drew my initial interest, but the boat is far more than that. 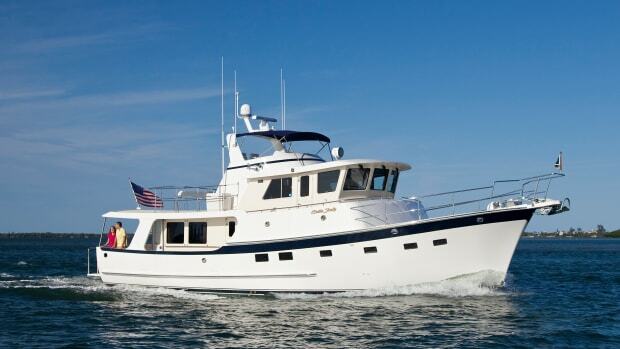 To me, this craft is really about outstanding interior design that maximizes sight lines and natural light, combined with terrific naval architecture and construction methods that yield great economy and handling along with a quiet, comfortable ride. 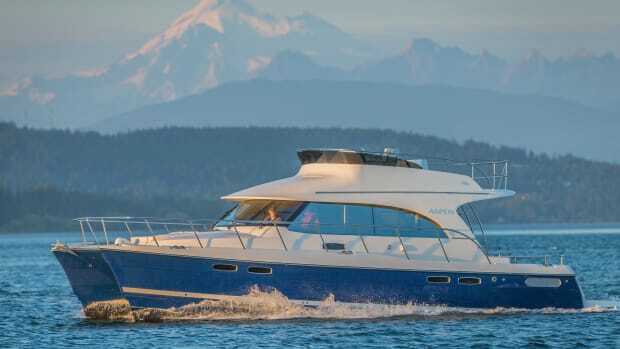 With a full range of Greenline boats on or entering the market—the 33, 40 and flybridge 48, plus a separate line of semi-custom yachts in the 57- to 70-foot range under the OceanClass brand—there’s a hybrid in every size, for the serial boat buyers among us, myself included.